Add "defenseless player" to the list of things the NFL fails to define clearly and enforce consistently. This was admittedly a hard shot to his chest area toward the end of the game, and Peppers himself even said after the game that he believed the referee made the proper call. Peppers said, "I thought after the game, they'll review it and see I didn't maliciously try to hit a guy helmet-to-helmet." Later in the week after letting it sit a while and seeing the replays himself, he became increasingly confused as to why the hit warranted a personal foul. The real issue and confusion came, though, when Peppers received a letter from the NFL. Upon opening and reading it, he learned that the NFL decided to discipline Peppers further for the hit. The League is fining him exactly $24,309, which is the precise amount assigned for a hit on a defenseless receiver and the increasingly-accepted impermissible helmet-to-helmet contact. These are the violations & accompanying fines for 1st & 2nd offenses. The NFL sets these standards, but its reasoning in justifying particular amounts - whether the value happens to be on the list or attributable to an unfitting violation category - and enforcement is inconsistent. It is positively fantastic that the League wants to reduce the number, frequency, and severity of head injuries as of late, but in its concerted efforts, something has gone astray. Erring on the side of player safety is usually a good thing, as these new game rules err toward a trend of non-violence, and there is nothing wrong with that when the official makes the call in the game and the player - and entire team - is disciplined as a result then and there. Should the discipline end there as being sufficient, or should someone be able to double down on that discipline after the fact? After all, the reasons we have punishments for rule-breakers parallel the primary functions of criminal law: deterrence, incapacitation, rehabilitation, restitution, and retribution. "No player shall target and make forcible contact against an opponent with the crown (top) of his helmet. This foul requires that there be at least one indicator of targeting (See Note 1 below). When in question, it is a foul. Lowering the head before attacking by initiating forcible contact with the crown of the helmet"
If Jabrill Peppers did appeal, I believe he would win. Under Article VIII of the NFL Constitution and Bylaws, the NFL Commissioner has the power to determine player disciplinary manners, and he has a good-sized toolbox of disciplinary action he can take with that granted authority. Under Article VIII, Section 8.13, if Roger Goodell, the current NFL Commissioner, finds that a player has either violated the NFL Constitution and Bylaws or has engaged in conduct detrimental to the welfare of the League or professional football, he can suspend and/or fine the player up to $500,000. Here, Peppers would have to point to the evidenced facts and connect them to the rules to support his case. Looking at the hit from another angle shows that Peppers neither leads with his head in hitting Malone nor has a malicious intent, for he lead properly with his shoulder in hitting him in the chest area and, as a result, knocking him to the turf and knocking the ball out of his possession. Translation: HE PLAYED WITHIN THE LEGAL RULES AND CONTEXT OF PROFESSIONAL FOOTBALL. Yes, it was a hard hit, and the helmets do touch, but it is not the rookie's fault that the rules of the game are inherently violent, regardless of the NFL's modern approach to player safety where it takes action in rule amendments and interpretation only to limit legal causes of action from arising. Maybe this shot should not be interpreted as being within the rules in the future (i.e., as the game official interpreted it in present day), but as the rules presently stand, this shot should be interpreted as legal. Also, Peppers could use other disciplinary action the League has taken this season to highlight that the sanction handed to him is classified incorrectly and should not be upheld. For example, compared to Rob Gronkowski's recent premeditated, malicious hit on a clearly defenseless player was outside the context of the game &, therefore, warranted the one-game suspension dished to him. In fact, many would say he got lucky with only being forced to miss one game when player safety should be a top - if not, the first - concern the League needs to keep at the forefront. Peppers did not use his helmet, which means the League saw the hit as a hit on a defenseless player. Was the Peppers hit as bad as the Gronkowski hit? No, but one would not be able to tell the difference if looking at the fine amount Peppers received - $24,309. Another example is the Steelers-Bengals game in Week 13 on Monday Night Football. That game was a yellow flag party (note: that is NOT a party you want to take place), and two players received one-game suspensions for their hits for "violation of safety-related playing rules." JuJu Smith-Schuster first drilled Vontaze Burfict, who was stretchered off the field and is undergoing concussion protocol, and then proceeded to taunt him. Shortly thereafter, George Iloka hit Antonio Brown in the face mask. In those hits, both players openly went for the head, and in Smith-Schuster's case, the malice was in plain sight as well. 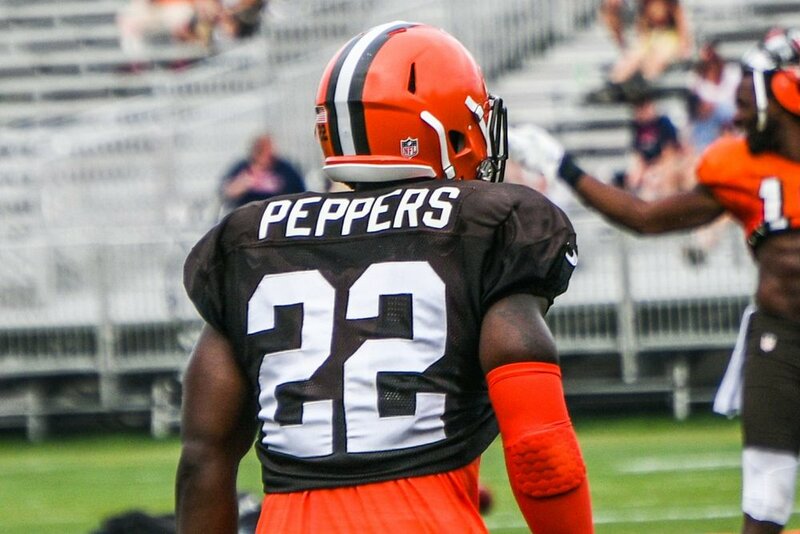 Peppers' hit evidenced no malice and appeared involuntary. The funny thing is that any argument the NFL likely would assert could not be taken seriously enough to uphold the fine so long as anyone objective sat as the arbitrator instead of someone with loyalties to the League or Roger Goodell himself. Upholding the large fine on Peppers likely would not deter football players from making similar hits because a defender can only control to a certain extent what happens. Physics takes over, and a player's hit largely depends on timing and how the other player is positioning themselves in the middle of making a move. Upholding the fine would not make Malone better off, it would not stop Peppers from executing similar plays in the near future, and as payback for something that Peppers is trained to do, it would not do much to serve a real purpose in professional football to further player safety concerns. Peppers' hit was not malicious, he led with his shoulder, he aimed low and not for Malone's head, the hit occurred within the context of the game, and, to me, this hit contrasts from the Smith-Schuster and Iloka hits in that one can fairly easily interpret the intention behind the hit to dislodge the ball from Malone's carry. The League needs to take a stance one way or the other to genuinely make player safety a top - if not, the number one - concern. Multiple avenues are available for it to do so. At a minimum, the NFL has to consistently interpret the rules of the game and sanction accordingly to set a precedent, show the players what is permissible and what will not be tolerated, and possibly from there create a rule or set of rules that may or may not mirror college football's "targeting" rule to protect players and give a definitive sanction for a particular style of hit, intrinsically putting players on notice. Any move aligned with those intentions would likely be applauded, especially since many have waiting a long time for them, and such a move improve the integrity of the game overall. So, I pass these thoughts on to you, the fans who love football and try to appreciate what it is and what the players risk every time they step onto the field. What do you think?